1 A None No Power Seat 1 A may have restricted legroom. The tray table is in the armrest, making the armrest immovable and slightly reducing seat width. The proximity of the galleys may be bothersome. 10 A None No Power Seat 10 A may have limited recline due to the exit row behind. 10 B None No Power Seat 10 B may have limited recline due to the exit row behind. 10 C None No Power Seat 10 C may have limited recline due to the exit row behind. 11 A None No Power Seat 11 A is a Main Cabin Extra seat that has extra legroom due to the exit row in front. The tray table is on the back of the seat in front. The window side armrest is attached to the emergency exit and is smaller than standard which may be uncomfortable. 11 B None No Power Seat 11 B is a Main Cabin Extra seat that has extra legroom due to the exit row in front. The tray table is on the back of the seat in front. 11 C None No Power Seat 11 C is a Main Cabin Extra seat that has extra legroom due to the exit row in front. The tray table is on the back of the seat in front. The window side armrest is attached to the emergency exit and is smaller than standard which may be uncomfortable. 15 A None No Power Seat 15 A is a standard Economy Class seat however the noise from the engines may be bothersome. The proximity of this seat to the lavatory may also be bothersome. 15 B None No Power Seat 15 B is a standard Economy Class seat however the noise from the engines may be bothersome. The proximity of this seat to the lavatory may also be bothersome. 15 C None No Power Seat 15 C is a standard Economy Class seat however the noise from the engines may be bothersome. The proximity of this seat to the lavatory may also be bothersome. 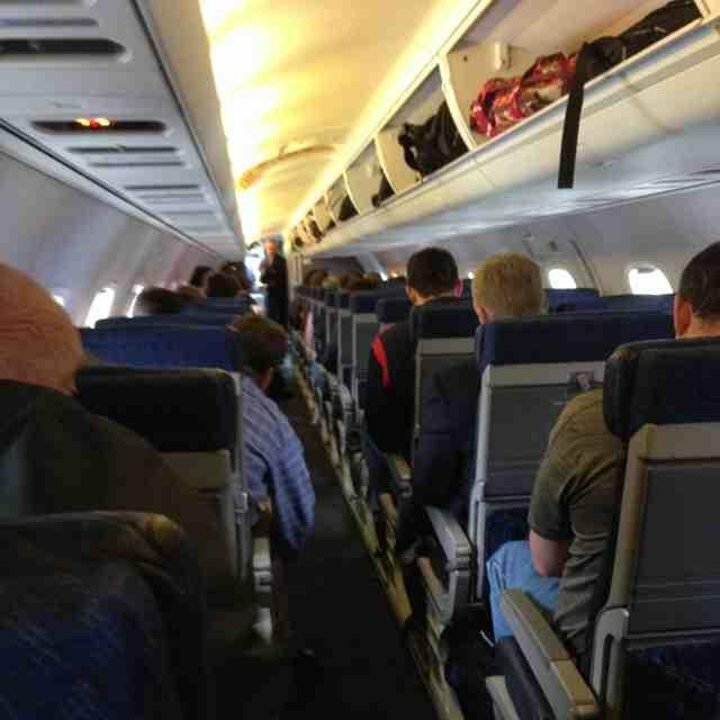 16 A None No Power Seat 16 A may have limited recline as the last row in the plane. The proximity of this seat to the lavatory may also be bothersome. 16 B None No Power Seat 16 B may have limited recline as the last row in the plane. The proximity of this seat to the lavatory may also be bothersome. 16 C None No Power Seat 16 C may have limited recline as the last row in the plane. The proximity of this seat to the lavatory may also be bothersome. 2 A None No Power Seat 2 A is a standard Economy Class seat however close proximity to the galleys may be bothersome. 3 B None No Power Seat 3 B may have restricted legroom due to the bulkhead. The close proximity to the galleys may be bothersome. The tray table is in the armrest, making the armrest immovable and slightly reducing seat width. There is no floor storage for these seats during take-off and landing. 3 C None No Power Seat 3 C may have restricted legroom due to the bulkhead. The close proximity to the galleys may be bothersome. The tray table is in the armrest, making the armrest immovable and slightly reducing seat width. There is no floor storage for these seats during take-off and landing. Complimentary light snacks such as pretzels and/or cookies are offered. Non-alcoholic beverages are complimentary. Beer, wine, and a variety of spirits may be purchased in Main Cabin. This aircraft type is operated by American Eagle. There are 59 of these aircraft in service and 25 that are in storage. 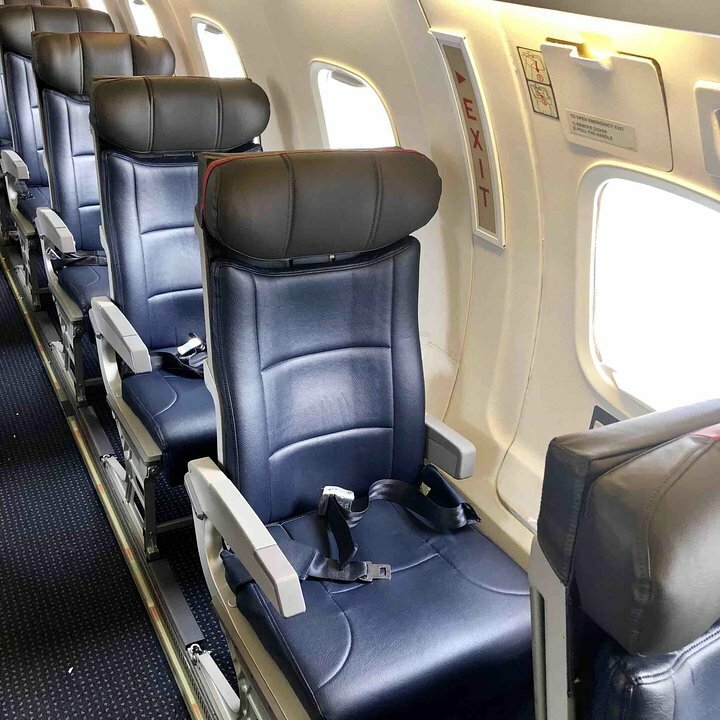 The ERJ-140 is very similar to the ERJ-135 but has three extra rows. This type is used on short-haul domestic segments and many passengers enjoy the 1-2 layout for comfort and personal space. Onboard storage is limited as there is only overhead storage on the right hand side. Standard rollaboard suitcases will not fit in these compartments and may need to be checked at the aircraft door. 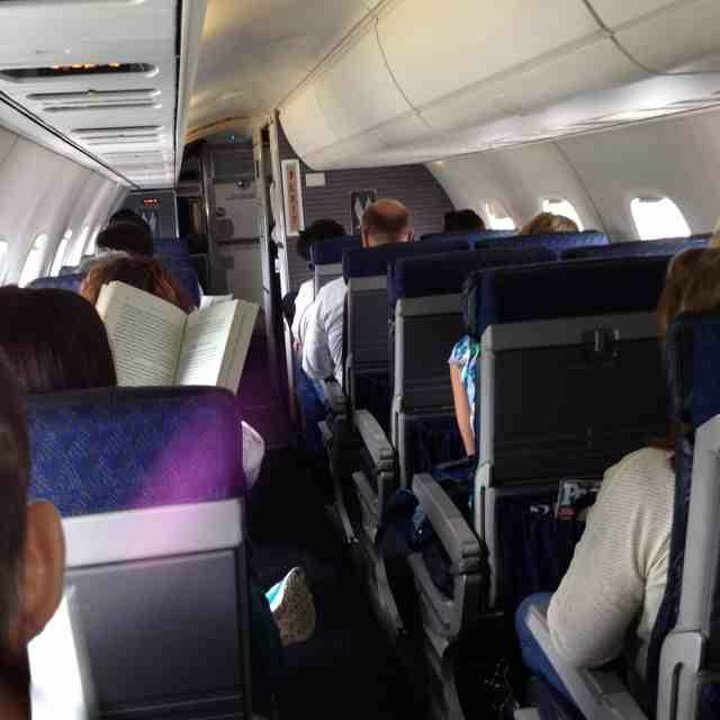 From time to time, passengers may be moved for weight and balance considerations. If you're tall & wide or used to first class on your domestic flights, stick with 11C on this small bird. The right side armrest is attached to wall and very small - hence, widens the seat. Exit Row is the only place on this plane with any legroom to speak of. You can survive here for an hour or two without too much pain. Considering how small this is, the experience is not bad: the seat is comfortable, tray table works well, everything was in good repair, and the ride was smooth and quiet compared to many regionals. That said, it is simply cramped - there is not much leg room, even less head room if you need to stand, no overhead storage on the left at all and small compartments on the right, and frankly the drink trolley barely makes it through the aisle without hitting everyone's elbows. It's fine for a very short ride (my most recent was CLT-CHO, which is about 75 minutes start to finish), but I would avoid on anything longer than 2 hours. I LOVED this airplane. when you first come to entrance you are shocked how small it is but once fly on it you are hooked. would prefer over big planes anyday. If I have the choice, I'll usually take 1A on ERD and ERJ-140 flights. There's a lot of legroom and it's very easy to get off the plane. It can be a little cold because of the proximity of the forward door. There is no overhead bin next to this seat, so you either have to go to the first full row or, sometimes, the flight attendant will let you put your bag in one of the storage cabinets. The seats on the ERJ 140/145s are the worst I have ever flown in. The seat angle is terrible with no leg room and you can hardly stand straight in the aisles. The turboprops I've flown in are better. Get flights on a CRJ if you can. Your body will thank you! This plane was not horrible for the short connecting flight from Miami to Charlotte as the seats were comfy (leather seats) but tight legroom and tight overhead and underseat space. around 8:30 Departure, good to be back in the US after a energy consuming time in Santiago going through extra security and then customs in Miami. But all went well, American Eagle's seats aren't bad to begin with at least. I enjoy this plane, and despite its small size, it's never given me a problem. The seats are comfortable and the 1-2 layout is ideal. Engine noise isn't as loud compared to some other RJ's. Gate-checking carryons is inconvenient, but it only takes 5 minutes for them to get brought up to the jetway. Regardless of the weather, the first 3 rows on this plane can be very cold! First off, avoid this type of Aircraft if you can. Small, bumpy flight, poor ventilation. The tallest spot while standing up is less then six feet, watch your head. Also these planes cannot handle standard carry on luggage. If it's a roller type, you will be asked to check it in. Good luck in bad weather, our plane was out of barf-bags, hint hint. The "A" seats on the left side of the 1-2 configuration sit on top of a raised platform (no overhead storage). The curvature of the side bulkhead and the step down into the isle severly limit available footspace width. 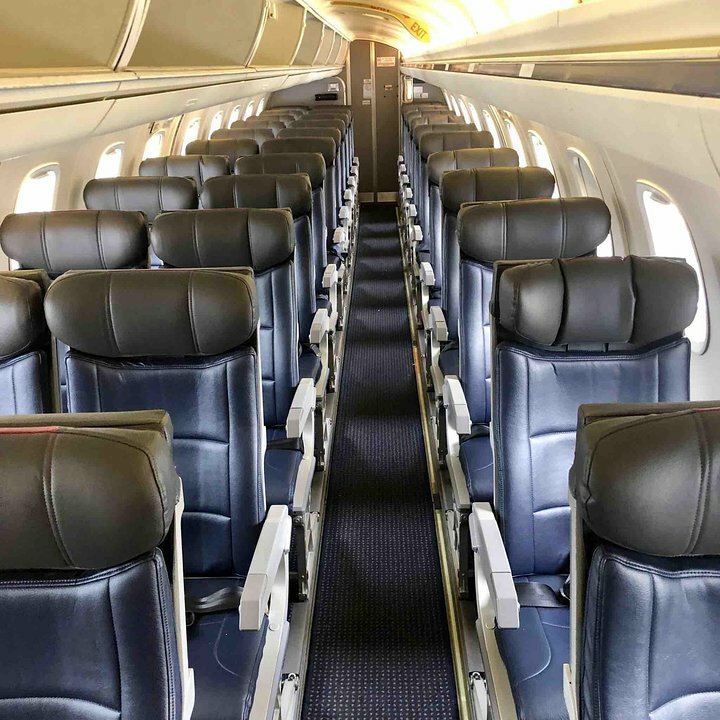 American Airlines flies 1 versions of Embraer 140 Regional Jet.